In order not to waste your time and money, before requesting an insulation bid, it’s important to choose a contractor who 1) knows the best insulation products to recommend (read our Insulation 101 Guide) for your particular situation, 2) understands the building envelope, and 3) is committed to safety, both in general, and on your job site. Before installing insulation, we need to understand the products and their application (where and why they are used.) It’s also helpful to understand climate impact on insulation, local code requirements, and what inspectors are looking for. This will greatly reduce failed inspections that lead to frustration, schedule issues and unnecessary cost. A well detailed proposal with the right information will take your insulation contractor just a little extra time, but a sloppy bid with no detail will lead to confusion, wasted time, schedule issues, and frustration, costing everybody time and money. Insulation is no longer an afterthought. It’s one of the key components of a proper building envelope and improving energy efficiency. Look at today’s refrigerators. They are three times more energy efficient than 20 years ago – all because of one change: the insulation inside them. Even high priced beer coolers. Ice won’t melt for several days…and they sell at a premium. The difference? 1.25” of closed cell foam. Smart builders know the importance of a well-designed building envelope. Regardless of the climate or region in which you’re building, or the type of structure, you want a well-conceived and detailed solution to meet (or exceed) energy codes and provide added value to the homeowner…without the hassles. How well we design the building envelope together is the difference that prevents the home from having energy efficiency, air quality and living comfort issues down the road. So, working together with your insulation contractor to get the building envelope components right the first time makes you the hero. Quality products and installation knowledge is essential. The priority on a job, though, is not about the product and technical details. It’s safety. And we start preparing and training on job site safety long before arriving to a job site. Being safe and avoiding hazards ensures that we get home safe to our families each and every day. It also ensures timely completion of jobs without injury, which is critical for our customers to stay on schedule, so it’s a business priority. Installer training requires compliance with a safe job site, proper PPE, equipment start-up and maintenance, inspection, etc. 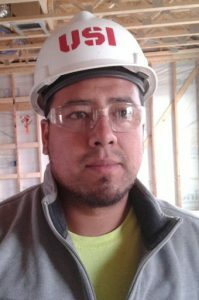 We also need to know how to walk through a job site to look for safety hazards and how to measure the temperatures of material, substrates, and the building. Mastering all of these safety considerations are critical to ensuring safety compliance on the job and ultimately customer satisfaction with our work. 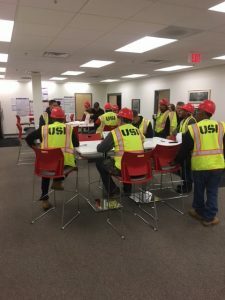 At USI, for example, we have promoted safety and ensured compliance through our playbooks, our training and certification program, and our job site safety inspection program. Doing our job safely every time ensures that we deliver what we promise on time and in accordance with safety regulations. When we are safe, our customers get to close on time, but most importantly, it ensures we get home safely every day and can do it again the next day. Having a great safety program enables us to do great work while ensuring we all get home safe to our families every day. 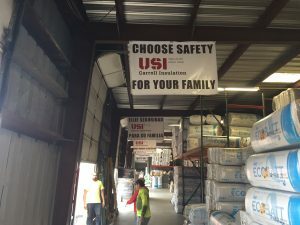 Safety is a priority for USI and a priority for our customers.